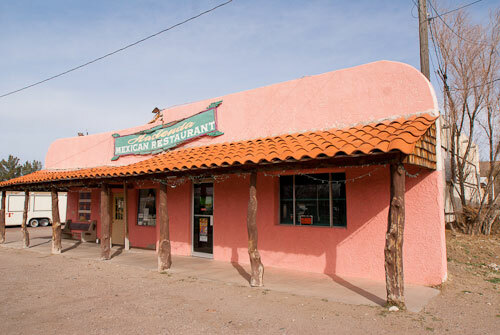 Located in Southern New Mexico, Truth or Consequences is a favorite getaway spot for us. That said, it’s not the most accessible city in the world. It?s a historic little town, with sidewalks in need of repair and curb-cuts that are somewhat of a challenge. And many of the businesses have steps up into them. It?’ a town with a lot of potential, but it really needs some TLC. On the plus side, I was happy to see some access improvements on my most recent visit there. We stayed at Riverbend Hot Springs, as usual, as it’s on the banks of the Rio Grande and probably the most scenic hot springs in town. They don’t have any accessible rooms, after all it’s only an eight-room property; however they have some decent pathway access to the upper hot springs (minnow pools). You have to be able to walk to transfer into the pools, as there’s no pool lift, but it’s still very relaxing just sitting out on the patio and enjoying the view. And to my great surprise I saw a lady in a power wheelchair doing just that on my recent visit. And although I was there for pleasure, I just couldn’t help but notice that there was ramp access up to their new addition. So as I was leaving I inquired about the addition, and asked if perhaps they were going to have an accessible room. And again, to my great surprise they said yes. Not only are they going to have to have a wheelchair-accessible room, but it’s also going to have a roll-in shower. Unfortunately it’s probably going to be a bit tight, as they took space out of the sleeping area to make the bathroom bigger, but at least you will be able to get a wheelchair in the door, and hopefully around the corner to the bathroom. And although we spent most of our time at the hot springs, we did steal away for a nice lunch at the Hacienda Mexican Restaurante. It’s not much to look at from the outside, but there’s level access to the entry and ramp access up to the dining room. And there’s plenty of room for a wheelchair at any of the tables. The food is great too, and the new owner whips up a flan that is second to none! In any case, I wasn’t looking for access when I set out on this little getaway, but I’m certainly glad that I found it. I love to see progress in unexpected places. Hopefully when we return later this year, I’ll have more good things to write about T or C! This entry was posted in Destinations, Food, Lodging and tagged access improvements, accessible travel, disabled access, Hacienda Mexican Restaurante, Riverbend Hot Springs, roll-in shower, Truth or Consequences, wheelchair-access by Candy B. Harrington. Bookmark the permalink.